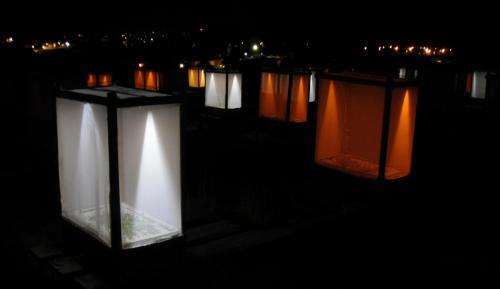 Researchers from the University of Exeter simulated the effects of street lighting on artificial grassland plots containing a community of invertebrates at night, exposing them to two different types of light treatment - a 'white' light similar to newer commercial LED street lighting systems and an 'amber' light simulating the type of sodium street lamp still found in much of the UK. The low intensity amber light was shown to inhibit, rather than induce, flowering in greater bird's foot trefoil, a wild relative of peas and beans that is a key source of food for the pea aphid in grasslands and road verges. In mid summer aphids feed on the flowering shoots; the number of aphids was significantly suppressed under the light treatment in mid-August due to the limited amount of food available. Professor Kevin Gaston, Director of the Environment and Sustainability Institute (ESI) said: "These are the first findings from major long-term experiments being funded by the European Research Council, and already reveal how profound the impacts of artificial night time lighting can be on even simple communities of organisms." Dr Jonathan Bennie of the ESI added: "Our results suggest that by lighting up our night time environment we trigger complex effects on natural food webs. While we are all aware that street lights often attract insects at night, we show that they may have more permanent, widespread impacts on wildlife and ecosystems." More information: 'Cascading effects of artificial light at night: resource-mediated control of herbivores in a grassland ecosystem' by Jonathan Bennie, Thomas W. Davies, David Cruse, Richard Inger and Kevin J. Gaston is published in the journal Philosophical Transactions of the Royal Society B.